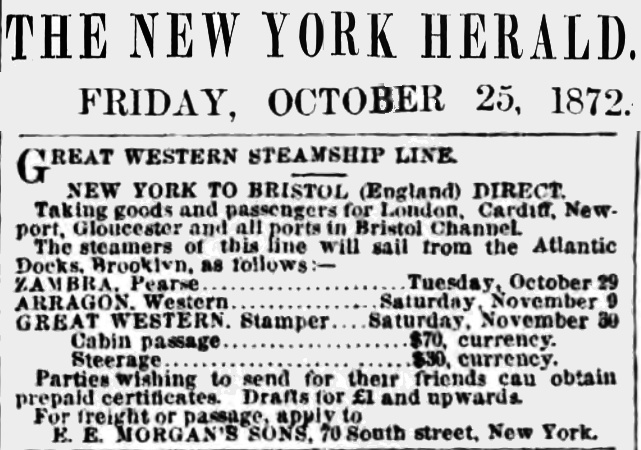 In 1872 the Great Western Line was sailing out of Red hook Brooklyn's Atlantic Docks taking passengers and cargo to a port near London and other ports along the Bristol Channel. Today, one can take the Queen Mary 2 from Atlantic Docks (now knows as Atlantic Basin) to Southampton ( a port near London) for $649. On it's face, a lot more money, but the buying power of $70 in 1872 would be equivalent to $1,448 today. Taking goods and passengers to London, Cardiff, Newport, Gloucester and all ports in Bristol Channel. Parties wishing to send for their friends can obtain prepaid certificates. Drafts for £1 and upwards. E. E. Morgan's Sons, 70 South street, New York.